In the top of the 5th inning, Jared Mahler (#10) of the Mammoth Huskies hit the ball to left field. 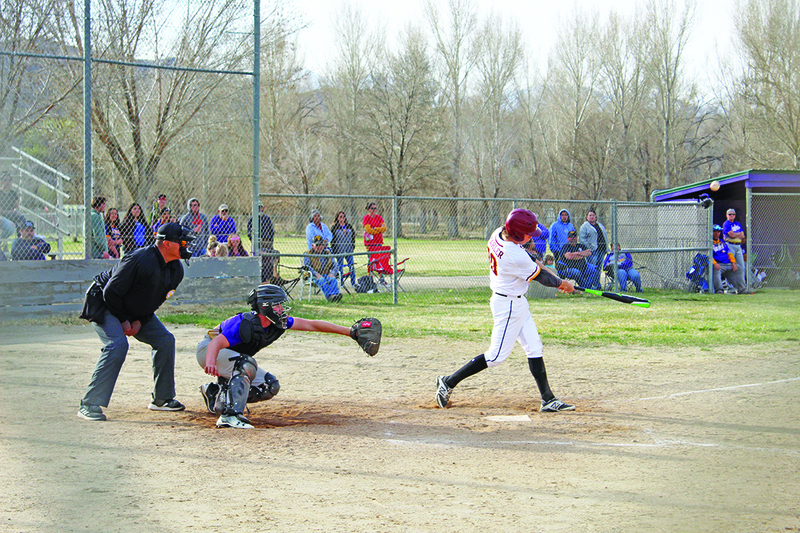 On Friday, March 22, the Mammoth Huskies Varsity baseball beat the Lone Pine Eagles, 16-0. The game was played in Bishop City Park because Mammoth’s Whitmore Field remains under snow. Mammoth Head Coach John Martin said the team found out last Friday they are ranked 3rd in the CIF Southern Section, Division 7. Greg Patrie, father of Huskies pitcher, Storm Patrie, and volunteer assistant, said they have been practicing in Mammoth’s basektball gym and most of their games have been away. The season started on March 6th and will end on April 25th. The team’s first outdoor practice is Friday, March 29, in Bishop. The next game for the Huskies is a “tough double-header with Desert Christian,” on Tuesday, April 2. First game at 1 p.m., second at 3:15 p.m., at the JV Bishop High School baseball field. “This will dictate the rest of our season. We expect some good, high-level baseball,” Martin said. At this time, the team has 8 wins and 1 loss, which is “the best start we have had in many years,” Coach Martin said. Mammoth Varsity softball lost its first league game to Lone Pine, 3-24. “The time they get to practice on the dirt is an hour before the game— the only time they touch dirt,” Coach Swisher said. “I’m really proud of our girls,” Head Coach Dave Swisher said.